Office Hours are Monday through Friday 8:00 A.M. - 4:00 P.M. Registration Hours For All Grades are Monday through Friday 9:00 A.M. - 1:00 P.M.
Parents new to Toms River Regional Schools or those returning to any of the schools in our district must register their children at our Central Registration Office. We are located at 54 Washington Street in downtown Toms River, across from Town Hall. The staff at our office will be able to answer most questions regarding the schools as well as provide information regarding necessary paperwork needed for registration. It is not necessary to bring your child. You need only bring the required documents. IT IS REQUIRED THAT YOUR VALID PHOTO ID AND YOUR CHILD'S ORIGINAL BIRTH CERTIFICATE BE PRESENTED AT REGISTRATION. PLEASE BE SURE TO HAVE HAD YOUR CHILD'S DOCTOR'S VISIT PRIOR TO REGISTRATION SO YOUR MEDICAL INFORMATION IS UP TO DATE. Without it, your child can not be fully registered. (Exceptions may be for children who are not yet 5.) See below for other required documentation. Follow the link below to help you locate the correct forms for your living situation (see left under Proof of Residency for details). Tuition may be adjusted based on family income. You must bring an original birth certificate with a raised seal for any child you are registering. (We will make a copy.) Your child must have reached the age of 5 on or before October 1, 2018 for kindergarten. You must bring copies of specific documents to registration to establish residency or you will not be able to register your child. Use the forms referred to below and downloadable at above right to document your residency. If you and your child are residents of Toms River, Beachwood, Pine Beach, or South Toms River (i.e. you own, lease, or rent a home or apartment), bring copies of the four (4) documents for verification of residency detailed in the Application for Registration- Proof of Residency Checklist. If you are not a resident of Toms River, Beachwood, Pine Beach, or South Toms River, but are legally domiciled with your child in the home of a resident, the resident (homeowner) must provide the four (4) documents for verification of residency detailed in the Application for Registration- Proof of Residency Checklist AND the parent or guardian must provide two (2) documents for verification of residency as detailed in the Application for Registration- Admission of Domiciled Student Checklist. Bring both forms to help document what you have provided. If you, the parent, are not a resident of nor domiciled in Toms River, Beachwood, Pine Beach, or South Toms River (read two descriptions above), but a Toms River resident is the legal guardian of your child, the resident/guardian (homeowner) must provide four (4) documents for verification of residency as detailed in the Application for Registration- Proof of Residency Checklist and the Affidavit of Resident Custodian; AND the parent must submit the Affidavit of Non-Resident Parent form. All three forms are needed. There are also special situations related to child protective services, court orders, and the military. Please call our staff at Central Registration so that they may assist you. Be advised that in addition to the Department of Education Regulations N.J.A.C. 6A:22 prohibiting such conduct, New Jersey State Law, specifically N.J.S.A. 18A:38-1(c), provides that any person who fraudulently allows a child or another person to use his/her residence for school admission purposes is guilty of a Disorderly Persons Offense punishable under the New Jersey Criminal Code. State statute 18A:40-4 requires that all students have a physical examination by a physician. Your physician will complete this form upon the conclusion of your child's physical. You may still register if your child has not yet had a physical, but the completed physical examination report must be signed by the physician and submitted to the school prior to starting school. 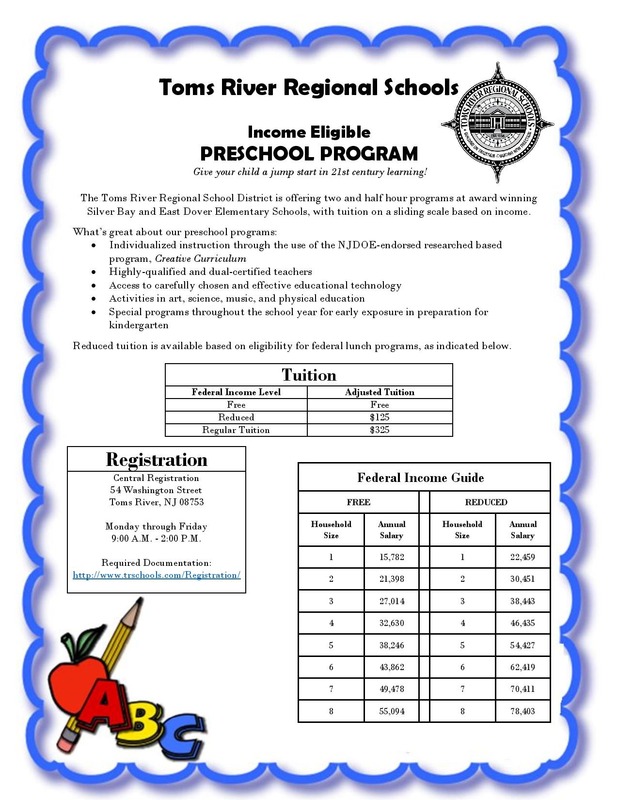 This form is to be completed by the parent for all new students entering Toms River Regional Schools, including issues like health concerns, disabilities and insurance. Provides a listing of the vaccinations your child requires prior to starting school. This requirement only applies in situations regarding parental rights, limitations due to divorce or separation. Yes, your child's original birth certificate (not a copy) is required at in-person registration. What if I'm not sure what school my child will attend for kindergarten? We will have a map and street listing to help you at registration. What if I use a babysitter in another area of town? What if I have not yet moved into my house but it is under contract? Provide us at registration with the contract of sale and the estimated closing date. You will have to provide proofs of your new residency within 30 days of moving in. What if my child is in the Toms River Regional community for court, child services, or military reasons? Bring in documentation to that effect at registration or call our office for assistance. If you are unable to meet our residency and/or guardian requirements, please call our office at (732) 505-2600 for qualification.